A woman's golf bag should be classy and functional. Why settle for off-shoots of menasa bags with garish patterns and colors? The all new iBella Cart Bags incorporate the latest in fashion and materials for the women as market. Featuring quilted leather-like polyurethane material in sophisticated colors and patterns, let the iBella Cart bag make a statement about who you are. 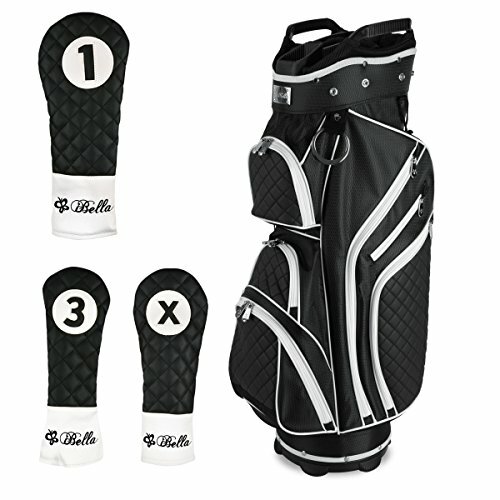 Set of #1, #3, #X matching head covers included. Features: 9.5-inch top with 14 individual dividers, Front position extra-large putter pit fits modern grips, Rubberized dual side lift handles, 8 zippered pockets including a velour lined valuables pocket with waterproof zipper and an insulated hydration bottle compartment, Padded rear carry strap with sleeve to secure strap when not in use, Towel ring with Velcro glove attachment, umbrella holder, scorecard sleeve, and rain hood cover. If you have any questions about this product by iBella, contact us by completing and submitting the form below. If you are looking for a specif part number, please include it with your message.